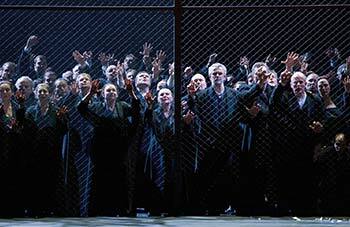 ABOVE: Hebrew prisoners in the Bavarian State Opera's 2008 production of Giuseppe Verdi's Nabucco. Learn about the company, which was founded in 1653 and offers a year-round program of operas, concerts, ballets, and music festivals. Take a guided tour through the opera house, with visits to the auditorium, backstage areas, and a dressing room. Celebrate Munich's 850th birthday by attending the Münchner Opernfestspiele (which includes a number of free events) in July. This new production of Giuseppe Verdi's breakout opera premiered in January, 2008. Top photo copyright © Wilfried Hösl. 1st, 3rd, and 4th inset photos copyright © Wilfried Hösl.